Need to get back on track with your healthy eating? We have rounded up 10 of the best quick tips for a healthy diet that will instantly kick-start your daily diet to a more healthy state. Drink lots of water. Take a 1.5 liter (50 oz) bottle of water to work with you, and try to finish it all by home time. Eat five portions of fruit and vegetables every day. If you find this difficult, then remember that smoothies, juices and dried fruit all go toward your five-a-day quota. Never skip breakfast, as it's the most important meal of the day! 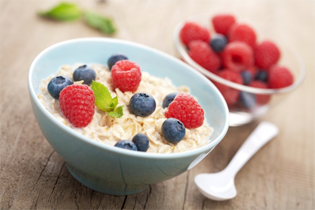 Opt for something that will release energy slowly-porridge and a handful of blueberries are a great option! Plan your meals for the week ahead. Write a shopping list and stick to it - and never shop when you're hungry, as this is a fatal error that inevitably leads you to stuffing your shopping trolley full of junk! Keep a supply of healthy snacks to hand. Snacks can include fresh and dried fruit, wholesome cereal bars, rice cakes, low-fat fruit yogurts and wholemeal pita and hummus. Remove all visible fat from food before you cook it. Take the skin off chicken and trim the white fat off any meat. Also, try to avoid eating too many processed meats such as sausages and burgers (the fat's not visible from the outside, but it's certainly there!). Limit your intake of stimulants such as caffeine, alcohol and refined sugar. Limit the number of times you eat out to once a week. Take your own packed lunch to work or choose (non-creamy) soup in the canteen. Eat properly. Don't cut out food groups - such as carbohydrates - altogether in a bid to lose weight quickly. Your body needs balance, so make sure you eat properly. And don't do denial - you'll only end up cracking! Only eat things you like the taste of. Find what works for you, and don't force yourself to eat things because they're good for you.